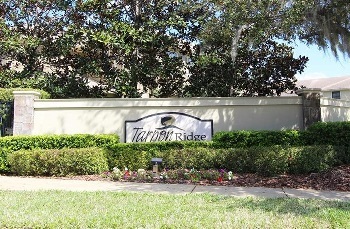 Tarpon Ridge is a gated, deed restricted community in the upper section of Palm Harbor, Florida east of US Highway 19 N just north of Alderman Road. It is home to one of the newer real estate communities in Palm Harbor featuring both townhomes and villas with energy star rating. Tarpon Ridge is an attractive neighborhood of neatly manicured properties newly built. Tarpon Ridge fashions impressive three bedroom town houses for sale with spacious kitchens, loft, volume ceilings, walk-in closets, screened in patios, upgraded features throughout, and two car garages. These new townhouse style homes offer 2200 square feet and 2250 square feet of spacious living and are moderately priced. The villas are single story and boast 2 car garages with 1300 square feet. Tarpon Ridge is a community well worth the low monthly maintenance fee which includes lawn care, roof, exterior building, and escrow reserves. As a Tarpon Ridge homeowner, you can enjoy the community pool and recreation. Nearby to Tarpon Ridge, is the famous Sponge Docks of Tarpon Springs, marvelous parks, Lake Tarpon, and just minutes from the beautiful sandy beaches of the Gulf of Mexico. Tarpon Ridge is also close to all shopping, restaurants, movie theaters, and many other local entertainment spots. Selling your Home in Tarpon Ridge? Are you selling your home in Tarpon Ridge? Depend on Lipply Real Estate to get you the most out of a potential sale. Our highly skilled Real Estate Agents will work with you to make selling your home easier than you ever thought possible! Don't wait- call us today and speak with an agent directly or enter your contact information in the form below to get started! We look forward to hearing from you.